Is This Crimson Dynamo From Iron Man 2? Game Revolution posted an early preview for the upcoming Iron Man 2 video game tie-in, which is trying to distance itself from the awful Iron Man 1 tie-in game. The Iron Man 2 game will supposedly act as a companion piece with the movie, rather than a re-hashed playthrough of the film's story. In their report, the developers would only discuss and confirm one villain from the game: The Crimson Dynamo. What's so special about that? 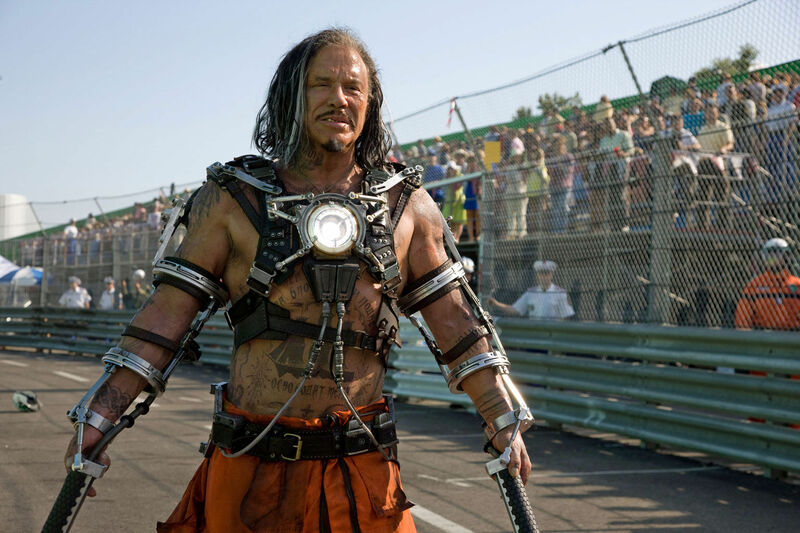 Well, when news of Mickey Rourke's possible involvement with Iron Man 2 first starting spreading, there was a lot of talk and speculation that he would be playing a Russian villain, whose description seemingly pointed towards The Crimson Dynamo as Iron Man's next dance partner. Later, when Rourke officially signed for the role, his role wasn't so clear as half of the reports explained that he would be playing the character of Whiplash and the other half were unclear or still speculating he would be The Crimson Dynamo. The photo above is from the race track scene where Tony Stark is ambushed by Whiplash. As you can image, speculation began that this costume in the pic above might just be the first version we see in the film, as Rourke is obviously not armored at all and probably couldn't do much against Iron Man's latest suits. So, what would Whiplash's full-on armored suit look like? Well, a preview comic for Iron Man 2 got solicited on Marvel's official website and it featured the following piece of artwork of an armored variant of Whiplash to be featured in the comic.